As mentioned in the previous post, Pitacalc is able to adjust the number of registers the calculator uses. This register bank resizing feature can be performed by using the rrb instruction. 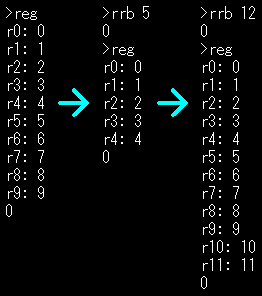 As one can see above, using the reg command, there are ten registers by default. By typing in rrb 5 to perform a register resize, the subsequent reg command shows there are five registers. The rrb 12 and the following reg shows 12 registers. It is possible have anywhere from 1 to 100 registers with Pitacalc. More features have been added since the last post. The current build, 309, contains new features such as color mode for the console and output in HTML format. Pitacalc is not a particularly useful tool that has many uses, but it does demonstrate how a computer performs calculations at the low level. Using Pitacalc is similar to programming a computer to do calculations in assembly language. Although actual computers don't work exactly like Pitacalc, having to enter instructions to perform calculations are similar.